What happens when your gender doesn't fit neatly into the categories of male or female? Even mundane interactions like filling out a form or using a public bathroom can be a struggle when these designations prove inadequate. 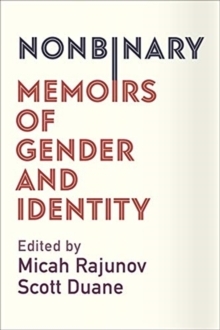 In this groundbreaking book, thirty authors highlight how our experiences are shaped by a deeply entrenched gender binary. The powerful first-person narratives of this collection show us a world where gender exists along a spectrum, a web, a multidimensional space. Nuanced storytellers break away from mainstream portrayals of gender diversity, cutting across lines of age, race, ethnicity, ability, class, religion, family, and relationships. From Suzi, who wonders whether she'll ever "feel" like a woman after living fifty years as a man, to Aubri, who grew up in a cash-strapped fundamentalist household, to Sand, who must reconcile the dual roles of trans advocate and therapist, the writers' conceptions of gender are inextricably intertwined with broader systemic issues. Labeled gender outlaws, gender rebels, genderqueer, or simply human, the voices in Nonbinary illustrate what life could be if we allowed the rigid categories of "man" and "woman" to loosen and bend. They speak to everyone who has questioned gender or has paused to wonder, What does it mean to be a man or a woman--and why do we care so much?